Graphs at a glance: Why is it that unemployment is falling, but wages and income tax revenues aren't growing? 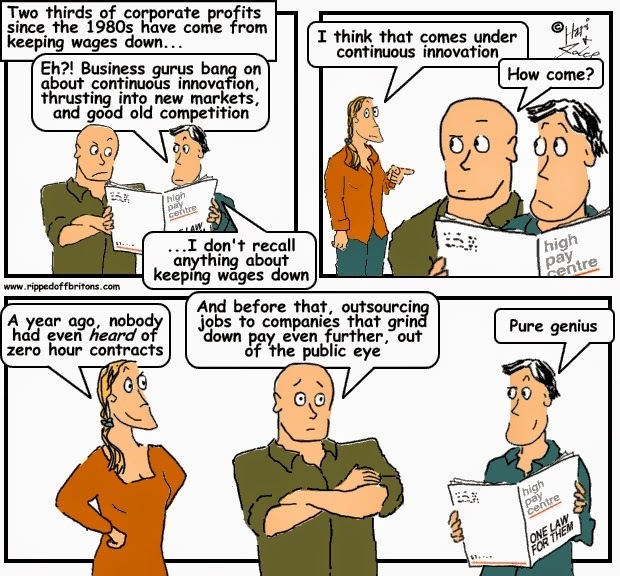 In October 2014 the BBC reported that FTSE100 company directors earned 120 times the average wage. An earnings figure that has shot up sixfold from just 20 times the average wage in the year 2000. 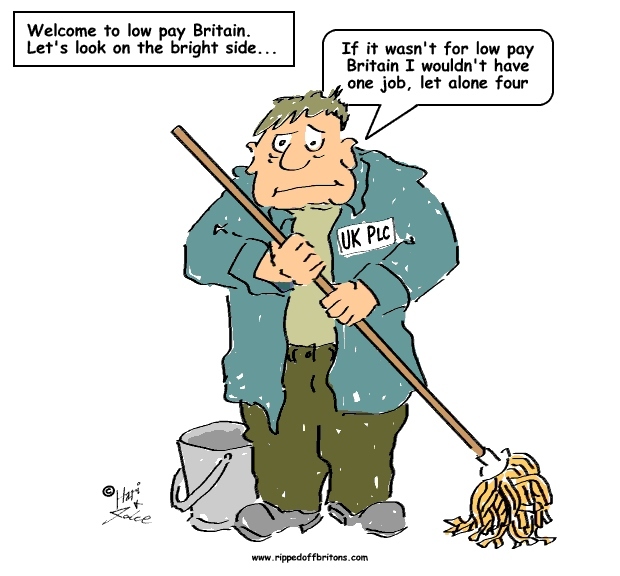 The BBC also reported that inspite of bumper top wage growth and generally falling unemployment, income tax revenues were going to fall below expectations. Why is this? 1) The Bank of England's May 2014 Inflation Report shows that the number of "full time employees" (the dark green lines in the graph below) had not recovered since the 2008 banker induced crash. The 'jobs recovery' is made up mainly of part-time and self-employed jobs. 3) According to the Resolution Foundation, "the typical self-employed person now earns 40 per cent less than the typical employed person." Some will assert high profits are good for you indirectly as corporation tax (paying for public services) and dividends (for pension funds). They hope you don't notice, and perhaps themselves don't realise, for every £10 taken from your paypacket only a fraction comes back in tax & dividends. 5) The Office of National Statistics (ONS) Labour Market Statistics count "anybody who carries out at least one hour’s paid work in a week" as "being employed". Which means people are dropping off the unemployment figures even though they may be earning just £6.50 for one hour's work in a week. The jobs "recovery" is not really the result of brilliant politicians, businessmen, and austerity bringing employment back to the nation. It is the result of Britons taking even a single hour's work when it is available. Sad to think the cartoon above is not very funny, more like real life these days. But the bankers still prosper (no doubt filling their boots at every chance) ! yes and filling wheel barrows carrier bags and whatever they can shovel it away in, while all the time telling us what gobshites we are.